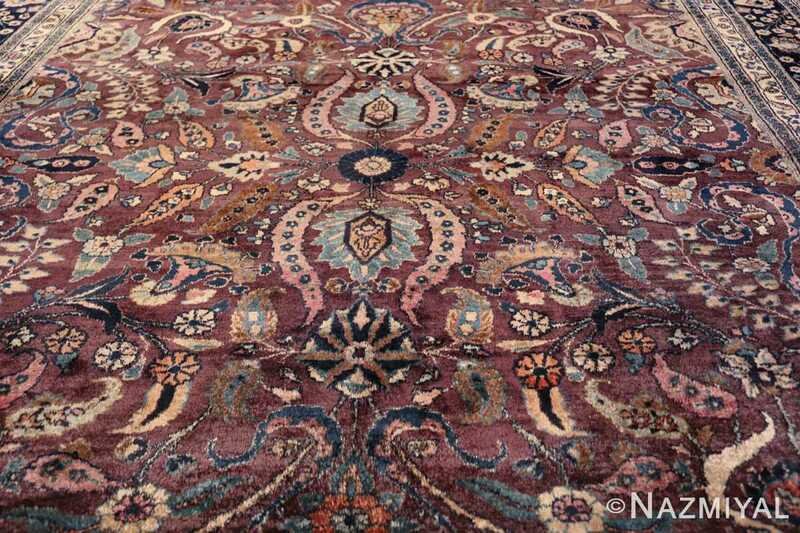 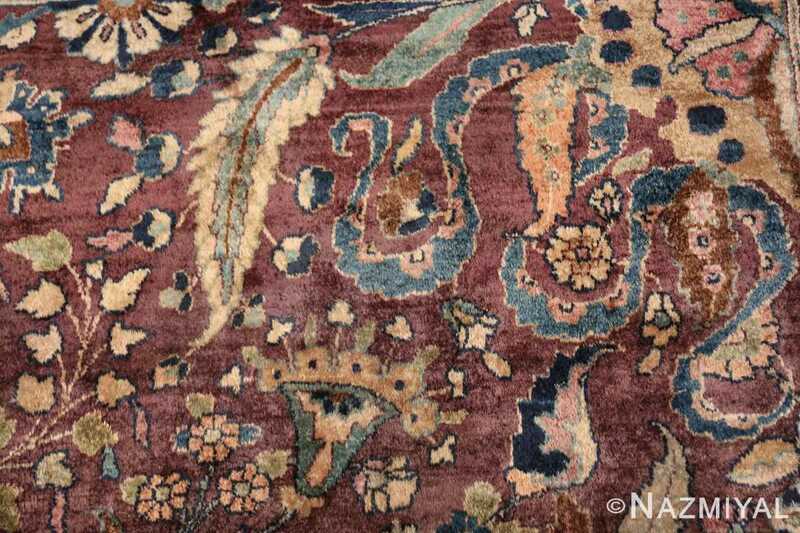 Breathtaking And Quite Rare Room Size Antique Purple Persian Khorassan Rug, Country of Origin / Rug Type: Persian Rug, Circa Date: 1920 - This magnificent purple color antique Persian Khorassan rug is a masterpiece of breathtaking splendor. 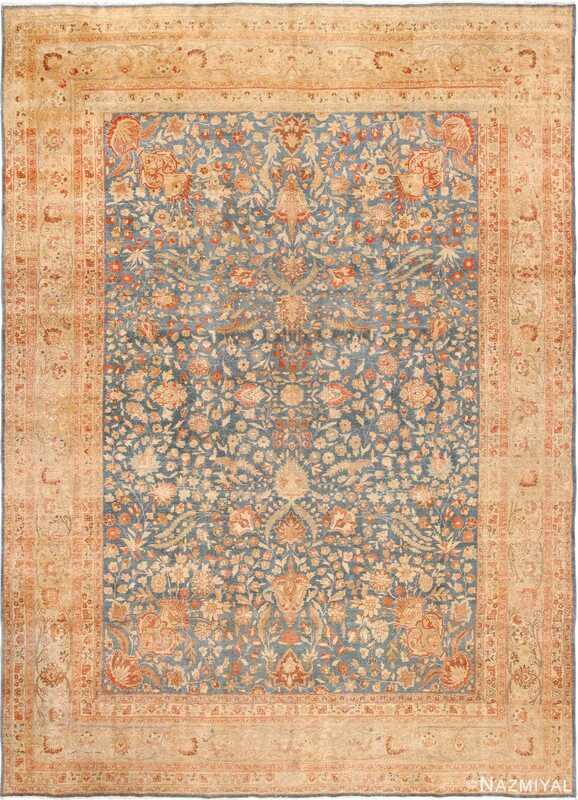 The rich purplish tone of the background is beautifully adorned with floral renderings in subtle shades of soft sandy yellow, rustic light blue, bold orange, pastel magenta and navy blue. 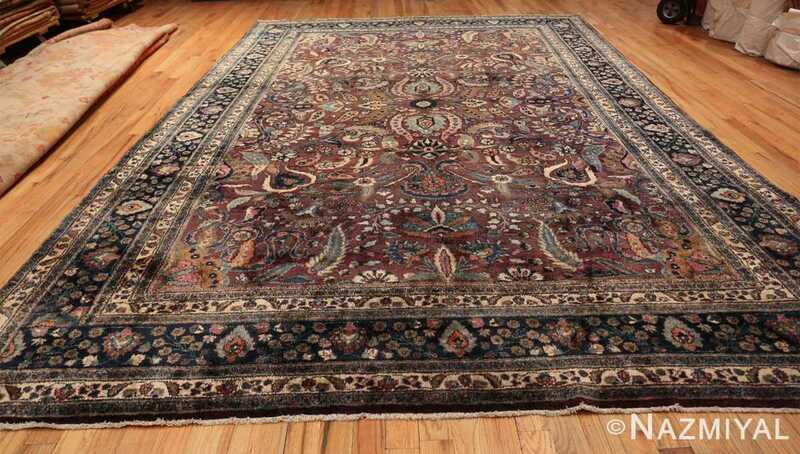 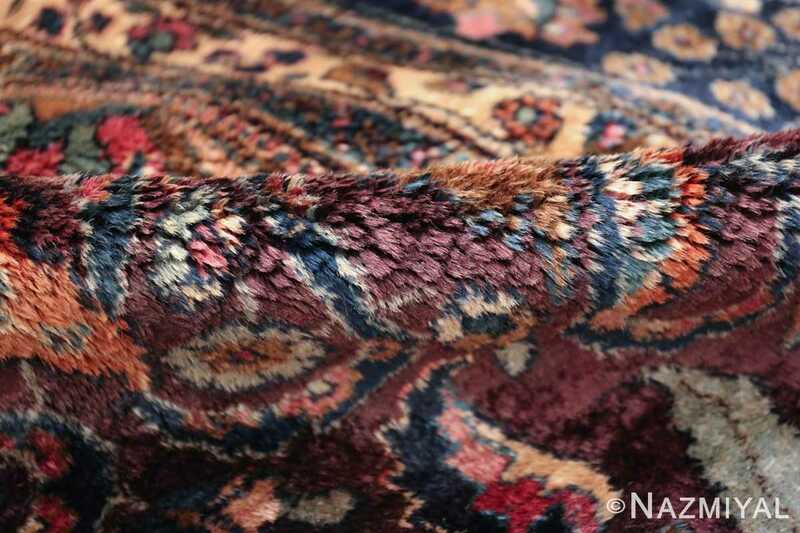 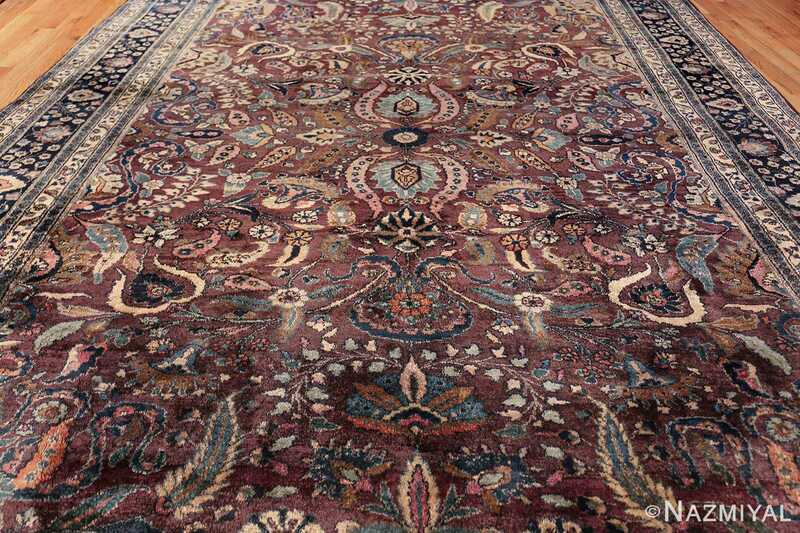 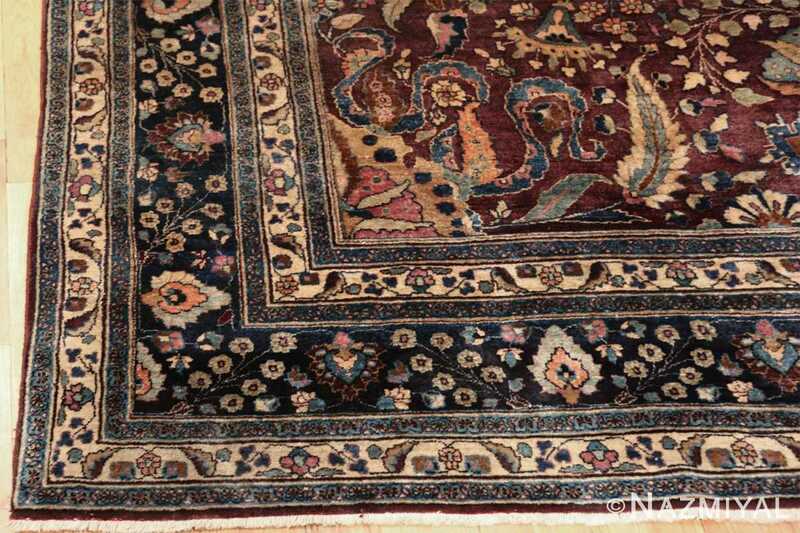 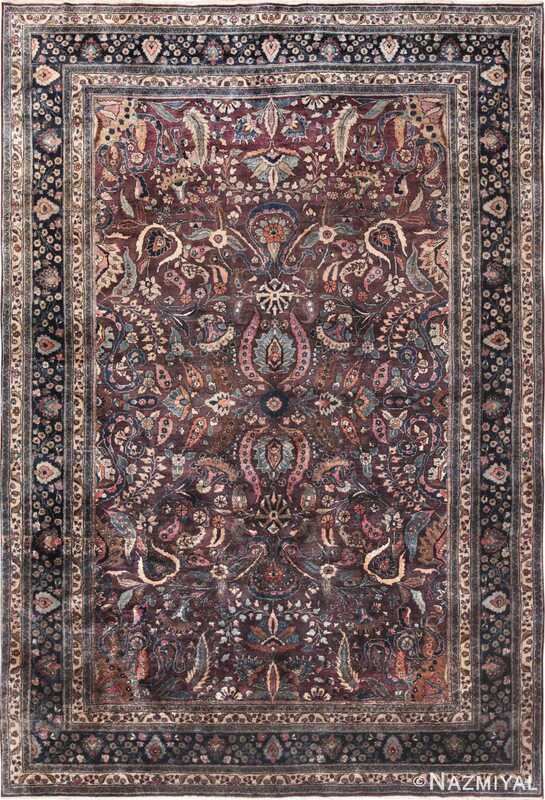 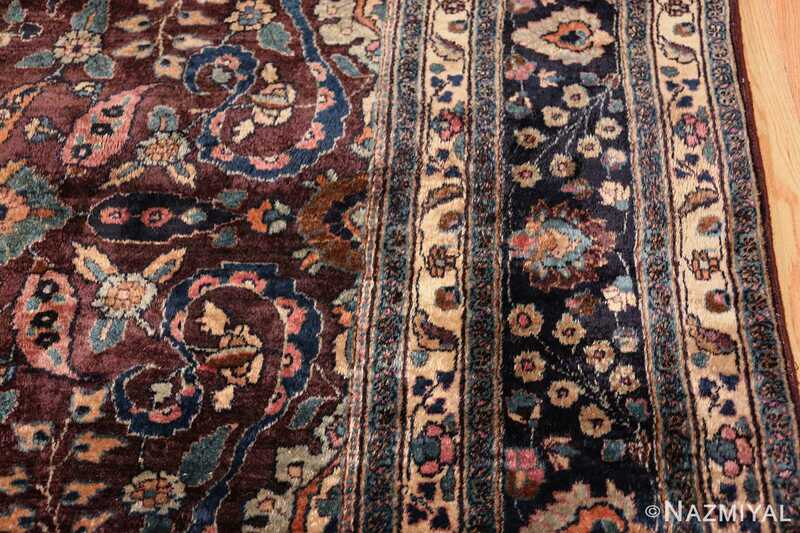 The entire surface design of this highly artistic antique Persian rug, from border to center, is brilliantly constructed for a wondrously fresh and delightful appeal. The central background of the field is a rich purple lilac color and the field itself is embellished with a tasteful array of various leaves and flowers. The center displays a mirror image structure, which is marked by two vertically opposed leaf formations. 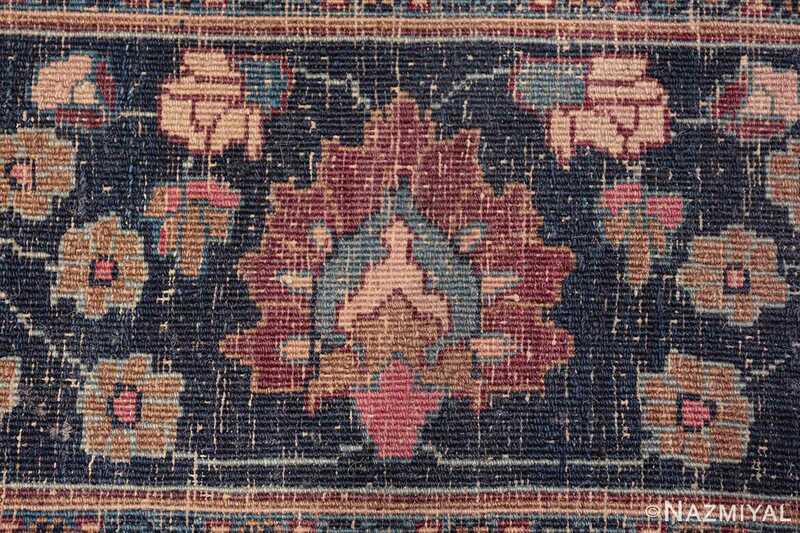 These images comprise a tear drop leaf shape, which is saturated with a grayish light blue color and encapsulated by two long magenta wreaths, which are studded with tiny navy blue florets. 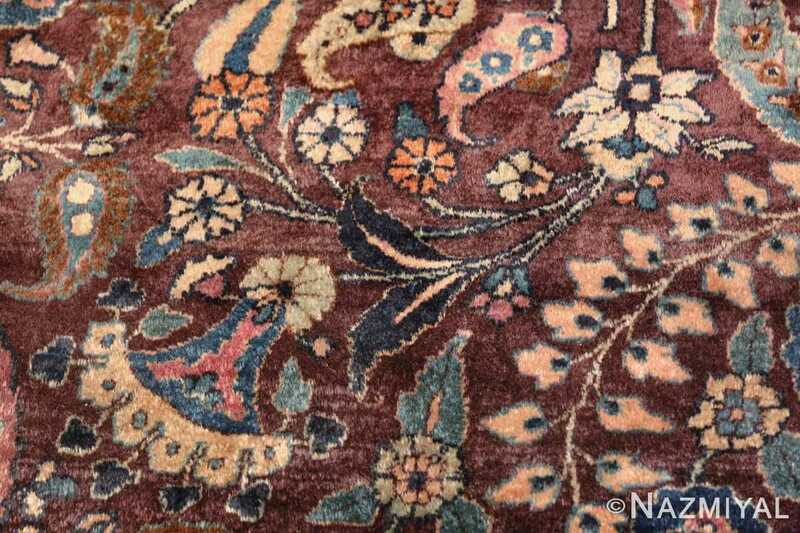 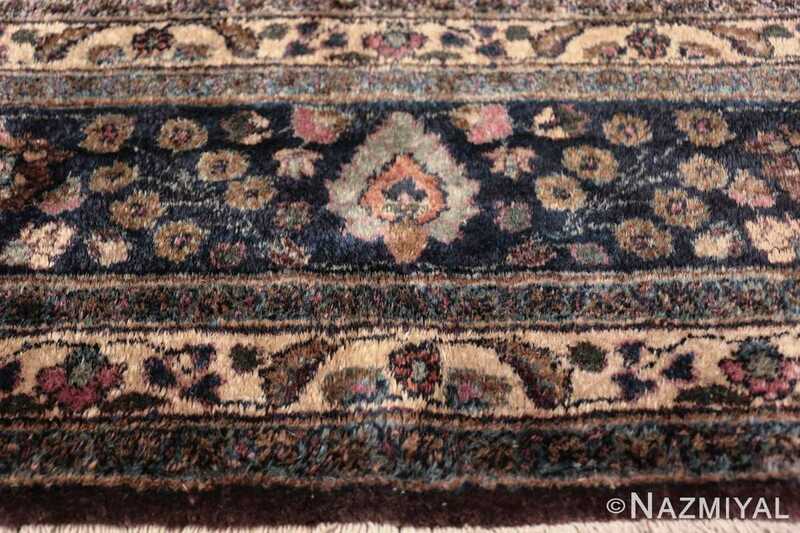 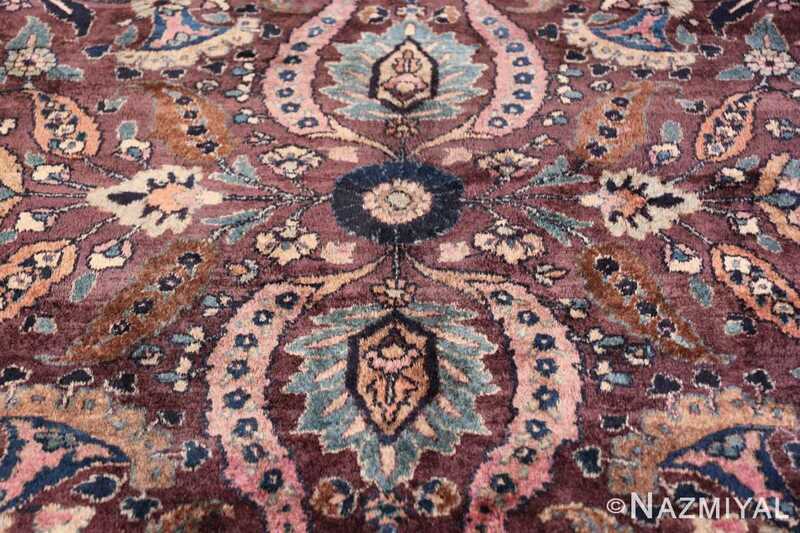 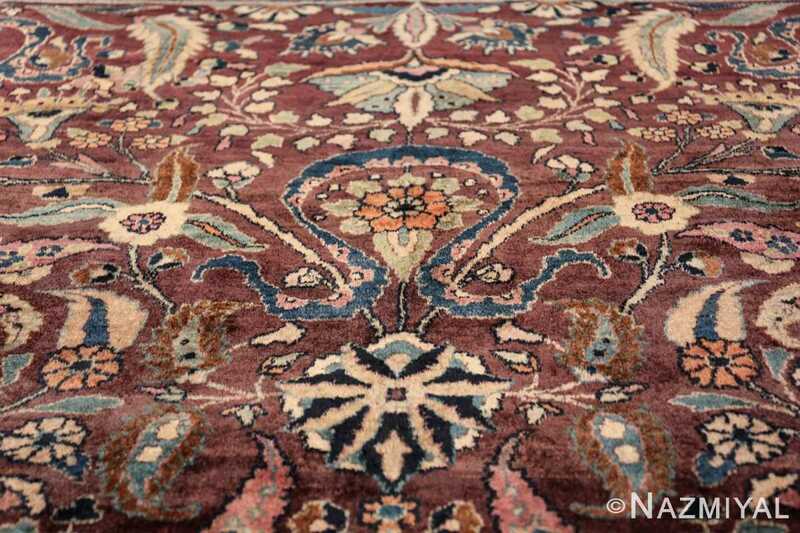 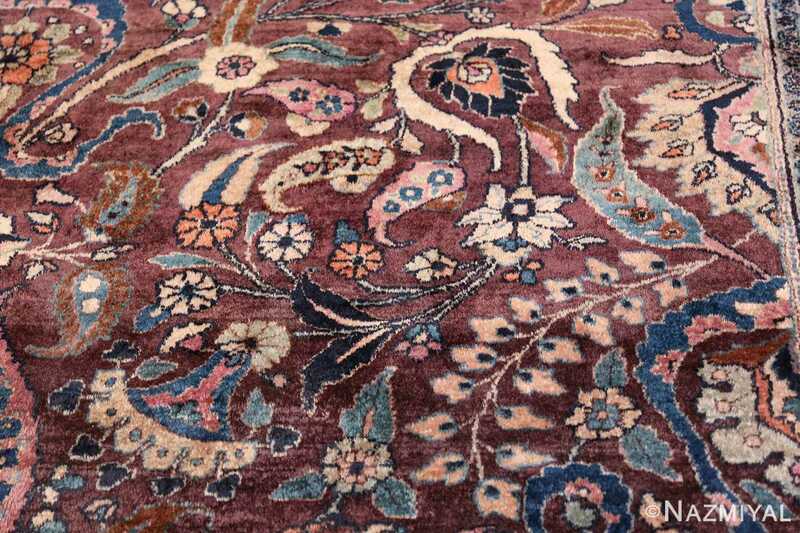 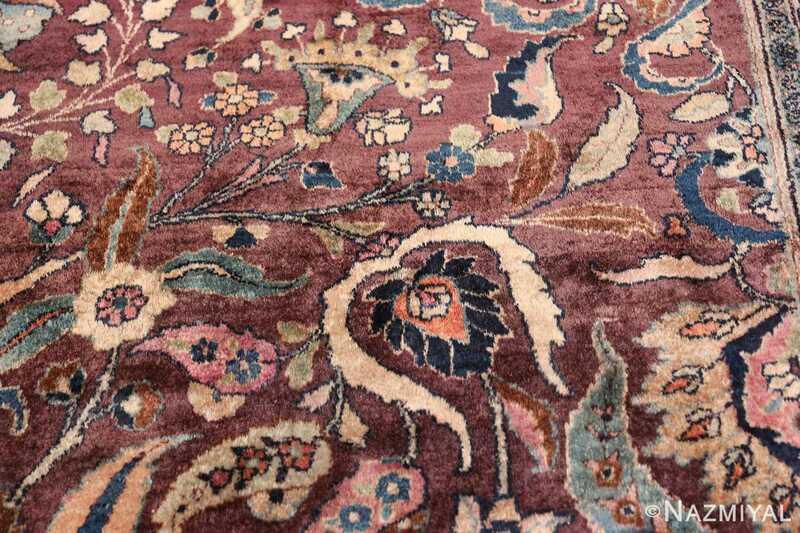 The horizontally opposed decorations are small gray leaves with brilliant orange and blue additions, and the nucleus is a velvety navy blue circle with a pastel magenta flower in the center of this breathtaking antique room size rug. 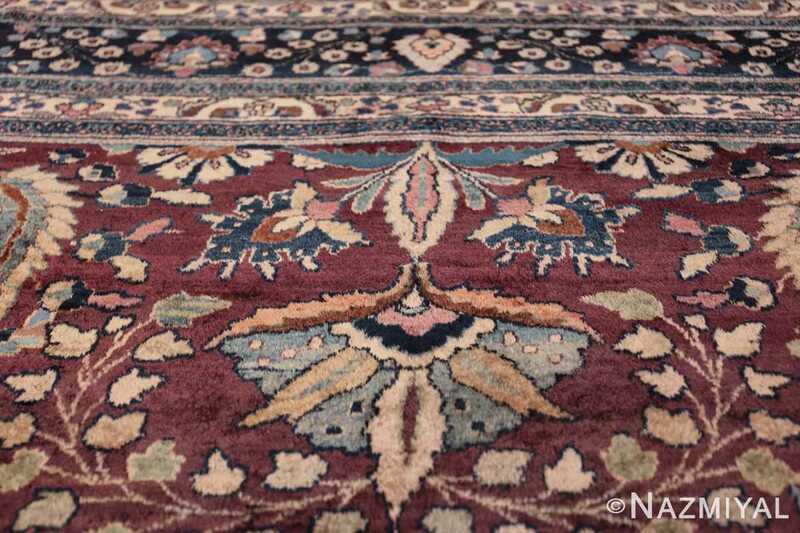 The elements in the central design of this magnificent antique purple Persian Khorassan rug, are repeated in stunning variations throughout the rest of the antique Oriental rug. Finally, the multi-layered border creates a perfect frame for the primary area of focus in the idyllic facade of this marvelous antique carpet. 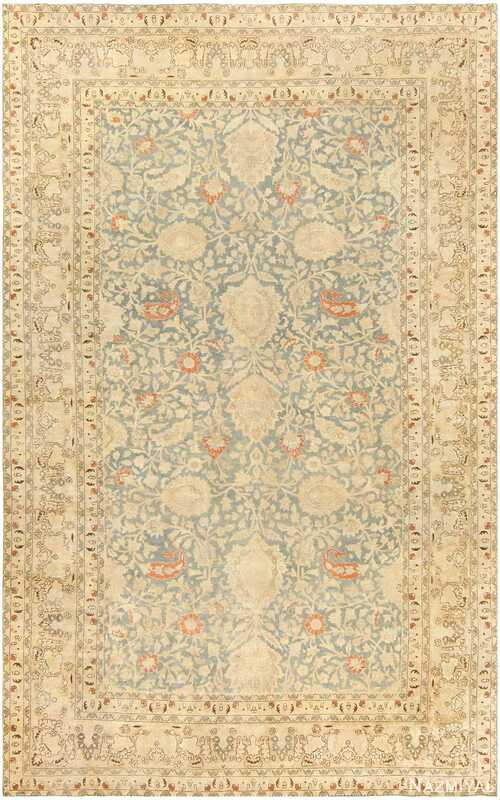 The widest strand is a velvety material saturated with a rich blue hue, containing delicate flowers and leaves in soft shades of gray, blue, beige, and orange. This glorious room size antique purple Persian Khorassan rug is sure to add a distinct and irreplaceable charm to any interior design setting. 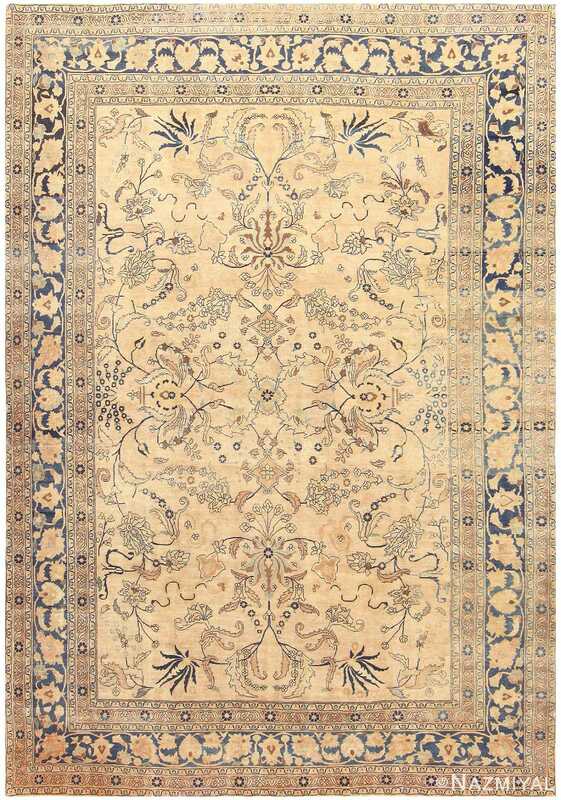 Stately and intriguing, this Persian antique carpet boasts a unique composition, in addition to the fascinating way that the rug's borders and the field contrast with one another.